The paracord monkey fist is a type of very well-tied knot, which has a serious history behind it. 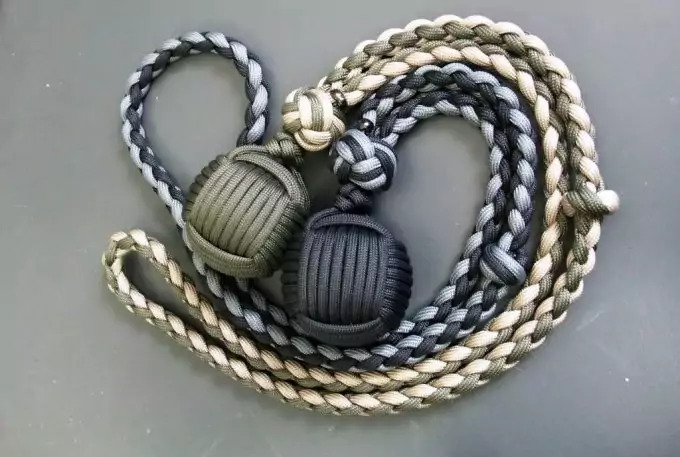 It’s basically an adjustable noose made out of cord, plus a marble ball or a steel ball in a knot at the end. As such, in this article we’ll cover the history of the monkey fist, tell you how it works and how you can make one at home, but we’re in no way advising you to use this for illegal purposes, but just for entertainment, since in some states it’s still considered an illegal weapon. 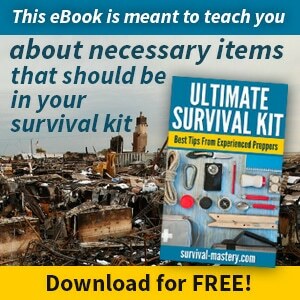 For a review of the best homemade self defense weapons, check out our article on this to learn more. What’s the history of the monkey fist? This knot was used by sailors at first to pass lines between ships or between a ship and the shore, mainly because it could add enough weight at the end of a line. Sailors didn’t use a marble or steel ball as we do now, but some other heavy object that could add some weight to the knot, like a bolt or a rock. After tying the knot properly and placing it at the end of a line or rope, the sailors used it to throw the message to their target with more precision. In point of fact, the knot is known as a monkey fist, but the rope acts like a flail, which is very accurate in delivering energy and momentum. This means that there is very much precision in the throw, but it also means that if another sailor were hit by this, he would be pretty badly injured. Sailors invented this type of conveying mechanism to replace the old one, which entailed the use of large, heavy ropes that weren’t as readily handled, and couldn’t be used with the same accuracy between ships as a means of communication. A convenient keychain – put your keys on the noose, and then inside your pocket or bag, but leave the knot outside so you can grab the keys more easily. A zipper pull – if your favorite bag has a zipper that’s too small, you can conveniently place the noose through the zipper, and then pull on the knot so you can open your bag faster. 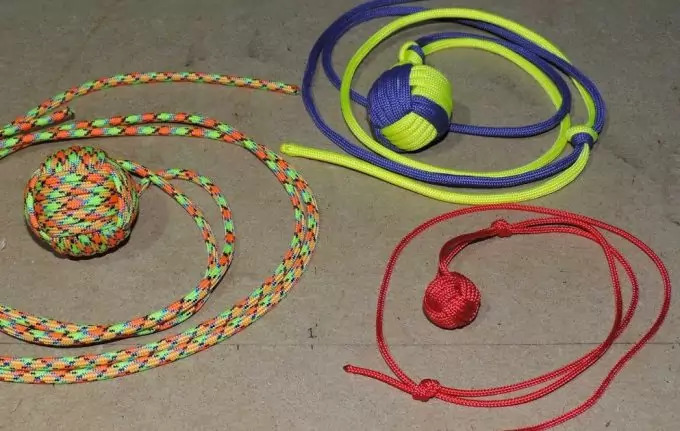 A toy for your pet – you can use this knot whenever you want to give your cat or your dog a new toy to play with, that they can easily roll on the floor. Skydiving – if you like this activity, then a monkey fist is exactly what you need to replace the traditional handle for your parachute, since it’s stronger and more durable. You can easily change it as often as you’d like, too. Rock climbing – this is an archaic use of the monkey fist, but it’s still good if by chance you remain with no other options: you can use this knot to break into the rock and get new grips for your hands and feet. 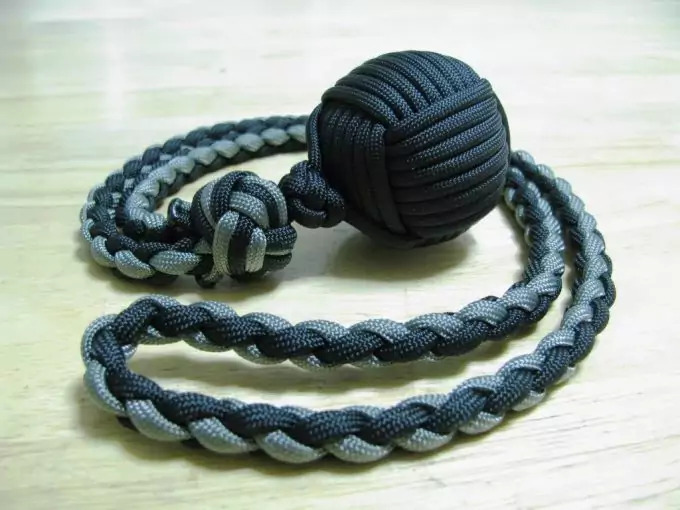 The monkey fist knot attached at the end of a paracord ingeniously employs basic principles in physics to obtain the most force and deliver a strong throw. Since force is the result of multiplying mass and acceleration, and since the steel or marble ball isn’t that heavy, you need to throw the ball very strongly, so that you can give the ball enough speed and accelerate it as fast as possible. Use your muscles to the max. Use more distance to create more acceleration. What you want to further achieve is a centripetal motion. So if your cord is 30 inches in length, don’t just throw the ball forward, because then you’ll only be using this distance. Instead swirl it in a semicircle with a radius of 30 inches from behind you to the front, and you’ll have a 3.14 times bigger distance, because a circle’s circumference is the result of multiplying its diameter (which is twice the radius) with π (3.14). Thus, instead of using just 30 inches of cord to accelerate your ball, you’ll have almost 95 inches of distance, which is a significant improvement. Hence, even if you have a very small lead, steel or marble ball, you can still put a dent in the rock you’re climbing, send an important message over a stretch of water or render someone unconscious if you’re not careful. How do you make a monkey fist? There are two ways to tie this knot, and we’ll show you how they both work, apart from telling you how to make the noose for the monkey fist. A marble or steel ball or a round rock. You have to be patient, because you won’t make it from the first try. You have to be particularly careful when you’re tightening the fist, because otherwise the cord won’t stay properly in place. You have to start with a longer piece of rope or cord than the final length you have in mind for your flail. You can’t have a good monkey fist without the ball you place inside the knot, because that’s what will make it tighter. If you don’t have a marble or steel ball, a piece of round rock works just as well for this homemade contrivance. Hold the rope properly. Hold your left hand open, and put the rope over its edge so that the short tail is in front of your hand, while the bigger portion of the rope is behind it. You will be working with the bigger end, which you will be using to create the knot. Wrap the rope vertically. At this point, you need to grab the rope by the long portion and wrap it around your fingers in three steps. The first wrap should be started in the area where your fingers meet with your palm, while the second and the third wraps are a bit higher and closer to your finger tips. You have to use your index finger, your middle finger and your ring finger – or just the first two – to wrap the cord easier. Slide this looped cord off your hand. Be careful to keep the same orientation even after you take the cord off, and pay attention to maintain your hand positioned similarly, so that the coils hold in place. Use your right hand to slide the cord off of your left hand, but keep the first set of turns where they are. You can achieve this by keeping the rope together with the use of your index finger and thumb. 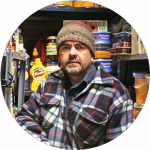 However, you also have the option of keeping the rope on your left hand if you feel more comfortable like that, and then thread the next horizontal coils between your fingers and palm. Wrap the rope horizontally. After you have successfully pulled the rope off your left hand, you can take hold of the long tail and wrap it perpendicularly around the 3 vertical loops you have, where your fingers used to be. Repeat this step 3 times, and each new horizontal strand has to be above the previous. You will therefore get 3 loops of rope vertically, which are now furthermore secured by 3 horizontal bonds. However, remember not to tie these horizontal bonds too tight, because they need to be a bit loose in order to create the perfect knot. After you have made the horizontal turns, create another coil with what remains of your rope, by placing it through the 3 vertical threads. Next, you should make the final turn by passing your rope through the middle and not the outside strand. Wrap the rope vertically again. At this point, you should be able to make another 3 vertical turns, by grabbing the long tail and wrapping it around the horizontal strands you’ve previously created. As you place the rope through the opening, you should pass through each horizontal wrap, but you should aim to place your rope between the first 3 vertical loops. You should have enough rope to do this wrapping 3 times. You’ll actually be weaving the rope around the already existing strands, but be careful to introduce it through the top part and pull it out of the bottom part. At this point, the monkey fist’s shape can be seen more clearly. Put the ball inside. 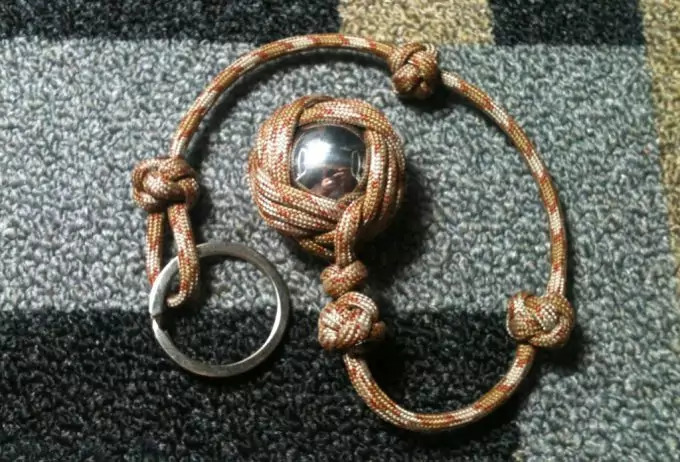 In order to make your knot stronger, you need to add something inside that will give it a bit of mass, like a marble, lead or steel ball, or even a nice roundly shaped rock. Even if you don’t have this sort of weight you can still finish your knot, but it won’t hold as tightly and strongly as if it had something inside to hold it in place. Tighten the knot. This step will probably take you a bit longer, since you have to be very meticulous about how you tighten the monkey fist. As such, you will have to pull and tug each loop very mildly, starting with the first and finishing with the last. Therefore, securing the slack means tightening each rope individually, but it’s important to follow the order in which you have created the loops. You will therefore begin with the first set of vertical coils, followed by the horizontal curls and then by the last vertical loops you’ve made in step 5. This is another great way to make a monkey fist, in case you’ve already mastered the first method. Hold the rope properly. The first thing you need to do is make sure that the rope is positioned well. If you’re right handed, then you should open your left hand and put the rope in your palm, but over the edges of your hand. As with the first method, the short tail has to be in front of your hand, while the long, working tail has to be behind your hand. This short end of the rope has to be pulled as much as it takes in order to go past your little finger. Again, you should be careful to have a long enough piece of rope or cord, so that the short tail doesn’t come out of the knot. Wrap the rope vertically. This time, the cord should be coiled vertically 5 times. You will have to grab it by the longer end, and then make 5 loops around your fingers. Each loop has to start near the place where your fingers meet the palm, and end up closer to the finger tips. These wraps have to be one on top of each other. When you get to the final loop, you’ll wrap to cord around the finger before wrapping the cord again around your fist. After this, you will pull the cord towards you. Pull the rope off your hand. You now have to maintain the same orientation of the rope that it had on your fingers, and you can do that if you keep your left hand positioned similarly, in order to prevent the loops from falling apart. As with the first method, some people might find it more comfortable to keep the paracord on their fingers. If that’s your case too, the horizontal loops you’re doing in the next step have to be placed between your fingers and palm. Wrap the rope horizontally. In this step, you will have to tie the rope horizontally 5 times. For this purpose, you should grab hold of the long tail of the cord, and introduce it perpendicularly around the 5 vertical coils you just made. You will repeat this movement 5 times, and each horizontal coil has to be on top of the previous one. When you are finished with this, you will get 5 rope threads which are coiled vertically, but are also secured together by 5 horizontal straps. Remember that you don’t have to secure them really firmly, but rather loosely.After you’ve done that, you should wrap the last remaining loop around the first vertical strand. Wrap the rope vertically again. Now you’ll have to work in the vertical plane again. Grab the long tail of your cord and place it inside the horizontal strands, from top to bottom. Repeat this motion 5 times. The cord has to be wrapped between the first vertical loops, but above and underneath the horizontal loops. The last loop has to be tied around the first vertical strand you created. Place the ball and tighten the knot. As in the first case, you need a weight inside the knot to strengthen it, and afterwards you need to tighten it by pulling mildly at every loop you’ve created thus far. 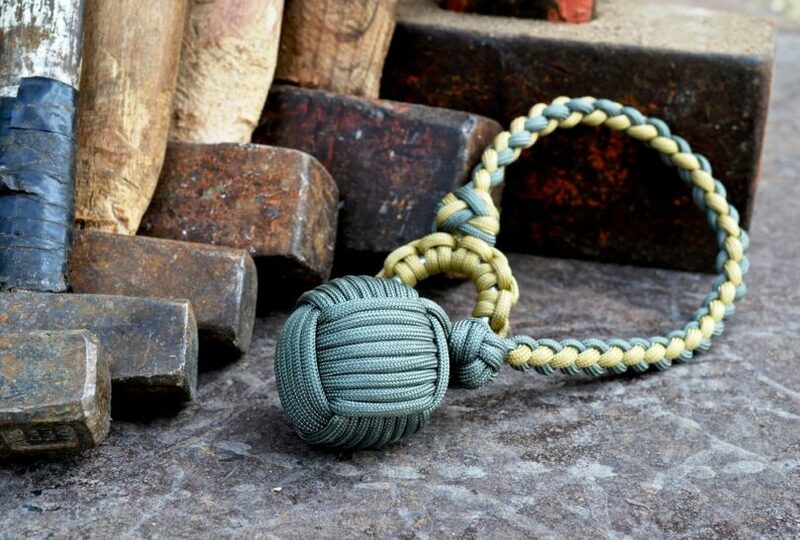 For more information on how to do the various paracord knots, see our article on the topic. Make the monkey fist knot. The first thing you need to take care of is to make this knot out of 3 or 5 strands, by following the steps we’ve previously listed. Additionally, you need to use a bigger piece of rope, which is long enough so that you can use as a noose. It’s also useful to have a key ring at hand, in case you want to use this noose as a keychain holder. Make the hangman’s noose. With what you have left of the rope you used for tying the knot, you can create a symmetrical “S” shape. After you have done this, you’re able to wrap the previously created knot around this sinuous shape of the rope. Do this 3 times consecutively, with similar movements as the ones used to create the monkey fist knot itself. Put the monkey fist inside the noose’s loop. At this point, you need to take the remaining strand and wrap it around 3 times, and each time moving up closer to the hole. 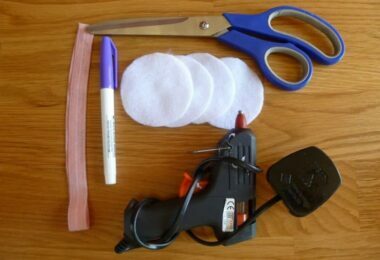 To make it hold better, use glue or super glue for the wraps and remember to cut off the excess paracord you might have. Add your keychain to the cord. If you have a key ring available, and want to create a keychain, you simply weave it around the hole that emerges from the knot’s end. After that, it’s just a question of attaching your keys and you’re done. That being said, if you hit someone with the ball in the knot it can hurt a lot; in fact, with the proper force you can even break a hole in the wall. Besides, you can grab someone with the paracord of the monkey fist or with the noose, but it’s not the most practical weapon. However, it’s best to remember that in some states it’s consider illegal and you shouldn’t carry it with you, not even in self defense purposes. As such, consider the use of other legal weapons, like pepper spray or a taser. 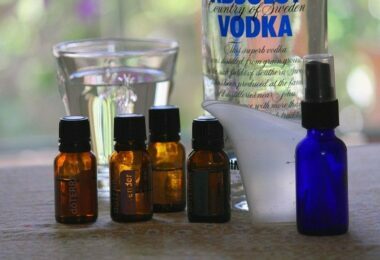 For a review of the best pepper spray, see our article on this popular topic.